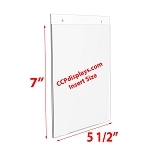 Did you know acrylic wall sign holders is also often called acrylic sign holder, plastic sign holders, wall mount sign holder, wall sign holder, plastic sign holders, horizontal wall mount sign holder, vertical wall mount sign holder, wall sign frames, acrylic wall frames and wall sign display. At CCPdisplays.com, we take pride in the number of acrylic wall sign holders we produce. 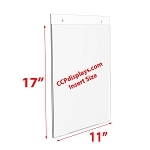 We carry a number of different styles and sizes from Acrylic Wall Sign Holder - 8 1/2 x 11 to small wall sign holders - Acrylic Wall Sign Holder - 4 x 6. Our clear acrylic wall sign holders are all in stock ready to ship. All our acrylic wall sign frames are manufactured right here in our factory in the USA. 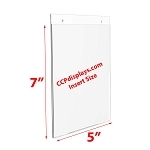 Plastic wall sign holders are a great way to deliver important information and be noticed may it be in a retail store, signage in an office, or a wall sign display at a store. 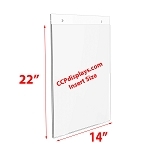 Looking for other acrylic wall sign holders - see our Acrylic Wall Standoff Sign Holder and Top Fold Wall Mounting Display that are both alternate wall sign holders. 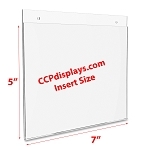 Need it ceiling hanging - see our Ceiling Hanging Poster Display. 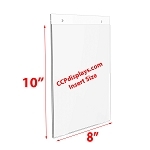 All of our plastic sign holders come highly polished at the lowest acrylic display prices. 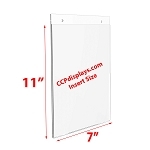 If its a vertical wall mount sign holder or horizontal wall mount sign holder - we have it! Do you need a custom wall sign holder? If you do not see the size listed -just send us a request. CCPdisplays.com - Your Acrylic Wall Sign Holder Factory!